Proven by research to reduce slip, trip and fall accidents by up to 70%. Customizable to suit your working conditions. Slips, trips and falls are the second largest work comp claim paid by leading insurers. We believe that such incidents can be significantly reduced through training and awareness, possibly leading to reduced injury and cost. The Iowa-Illinois Safety Council is currently 1 of 2 companies within the entire state of Iowa to own a Slip Simulator. In a combined research effort, Dr. Thurmon Lockhart of Virginia Tech University and United Parcel Service (UPS) teamed up to tackle this problem. In the first year, UPS east coast division reduced fall rates by approximately 70%. Decades of research and understanding led a kinetic learning approach: learn by doing. The end result was Slip Simulator Training. Your employees don't all do the same job, so neither should their training equipment. The Slip Simulator is designed to be modular. That means our trainers can quickly and easily change components to create a customized experience. Learning by doing has been proven effective. With the Slip Simulator, not only do your employees learn proper slippery surface walking technique first hand by doing it, the fun and engaging experience ensures they remember it. 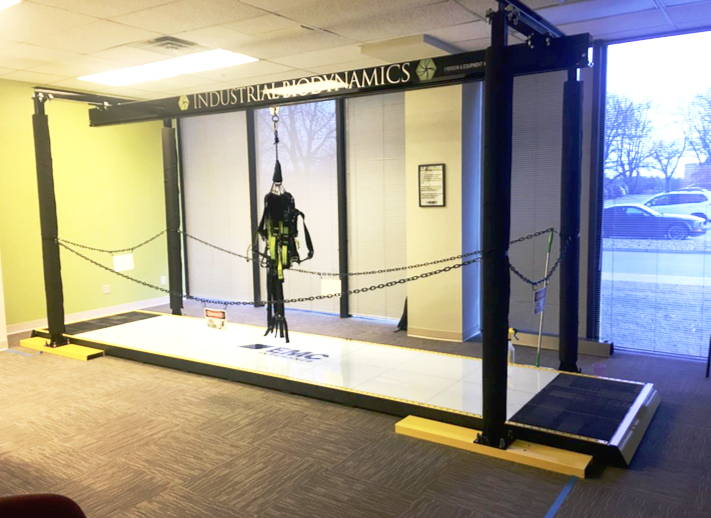 Contact us to book a time to learn more about how the Slip Simulator can reduce slips, trips and fall accidents among your employees. The Slips Simulator can only hold weight of 350 lbs or less.